Making good on its promise to continue broadcasting and in line with founder Alki David’s assertion that the antenna-based Internet streaming service was willing and able to comply with all the procedural requirements of the compulsory licensing programme, FilmOn Networks has announced that its combination of teleporter technology and remote antennas will operate under Section 111 of the Copyright Act 1976. “The Supreme Court ruling on ABC and Broadcasters v. Aereo on June 25, put an end to the use of remote antennas to stream broadcast signals, at least as a business plan for those who didn’t want to pay royalties,” says the company, claiming it was always willing to pay royalties and using Section 111 of the Copyright Act, would continue to provide local broadcast television from 18 markets to subscribers nationwide using its Teleporter technology. 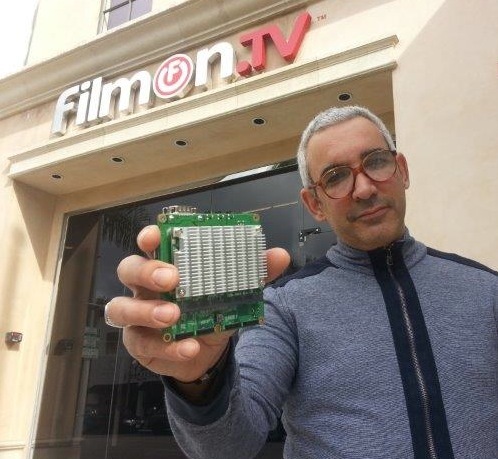 According to the company, as CEO Alki David predicted during appearances on Bloomberg News in 2012 and 2013, the result of the Supreme Court hearings has been that FilmOn should be regulated just as any other cable company. In those interviews David makes it clear he has always been willing to pay licence fees to local TV broadcasters. FilmOn Networks contends that the Networks were unable to make up their mind about how they wanted to handle the situation. “In 2010, well before Aereo launched, CBS Networks sued FilmOn arguing that it was not a cable company. More recently, in the case before the 9th Circuit – which is still pending – the Networks argued that FilmOn was a cable company,” it notes. “Now that the Supreme Court has made a very clear designation of Aereo and FilmOn as cable companies, FilmOn has once again filed with the United States Copyright Office for Compulsory License under Section 111 of the Copyright Act of 1976. (It originally filed for the same licence in 2011 and the request was neither granted nor denied),” it advises. According to FilmOn Networks, Justice Breyer’s remarks are very clear: If it functions like a cable company, it should be treated like a cable company. The likeness is called “overwhelming” and explained in great detail. “FilmOn meets all of the criteria,” asserts the company. “This was always about dragging the television business kicking and screaming into the 21st century,” says David. “FilmOn’s efforts were never about violating copyright as the Networks sought to portray it. The goal was always to deliver the experience consumers want and deserve, without exorbitant fees and the tyranny of bundling,” he states. The broadcast channels that FilmOn receives through the antenna farms at issue in the Supreme Court case have been moved behind the paywall and only FilmOn.com subscribers can access them (still leaving 600 licensed channels and tens of thousands of VoDs available free), notes the company. FilmOn Networks’ patented Teleporter system allows subscribers to borrow a remote computer desktop in any of 18 cities across America where FilmOn has a head end and view local television from those areas. This means the viewer is virtually visiting the region where the signals are being delivered, rather than the signals being streamed to the viewer. This virtual desktop is visible for a few seconds when the viewer first tunes in, in order to let him know he is ‘teleporting’ to another region. The cities where local broadcasts are being received for transmission are Atlanta, Baltimore, Boston, Chicago, Dallas, Denver, Los Angeles, Miami, New York, North Bergen, Pheonix, Seattle, San Antonio, San Diego, San Francisco, San Jose, Tampa and Washington D.C.